It was a dark and stormy night. . . and the Lady of the Manor was sitting by the roaring fire, awaiting the arrival of her evening cocktail. Something with the faint scent of the windswept Highlands, with just a hint of burnt orange. She could hear the bottles of whiskey being taken down from the high shelves above the mahogany bar, and smiled at the sound of ice rattling in the stainless steel shaker. . .
Or at least that's the little movie I've been playing in my head over the past few days. We've had two days of non-stop torrential rain and booming thunder, with occasional flashes of lightening. All of which I'm perfectly happy with because it fits right in with my "we're still in the UK" dream. In reality it's been back to school, back to errands, and back to driving (on the right side of the road) the boys all around town to their various activities. So it's definitely time for a cocktail. Mr. C&G had a classic Dubliner the other night (Irish whisky, Grand Marnier, sweet vermouth, and a dash of orange bitters), so I challenged him to make me a Scottish version to match the gloomy weather outside tonight. Slàinte! Combine in a cocktail shaker filled with ice, shake, and strain into a chilled martini glass. 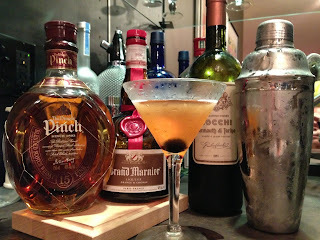 Garnish with a Luxardo cherry.